Matt C: A packed week for my pull-list with some highly anticipated books making an appearance. Top of the pile is, without question, is Lazarus: Risen #1. With a higher page count compensating for the new quarterly release schedule, this is a hugely welcome return for one of the best series of the last decade. 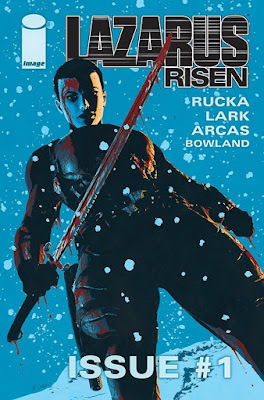 Whereas some expansive ongoing titles from Image have struggled to hold the attention effectively, often feeling like they've lingered longer than they should have, Lazarus has been constantly gripping and compelling, its impressive world-building never overwhelming the astute characterisations. Whether or not Amazon turn it into a TV series remains to be seen, but its majesty in the comic book format is unquestionable. In second place is Spider-Man: Life Story #1, with Chip Zdarsky following Peter Parker's life across each decade from the 1960s onwards, the twist being that Peter ages in real time (with art by - who else? - Mark Bagley). Zdarsky's been on a roll at Marvel recently and with such an interesting premise this six issue miniseries has the potential to offer an enticingly different take on the wallcrawler's adventures. Marvel also have the second issue of Meet The Skrulls coming out on Wednesday - the first issue was a delightful surprise (a shapeshifting, intergalactic version of The Americans!) and it's definitely not too late to get on board with it now. Finally from the House Of Ideas, a double whammy of Kelly Thompson goodness in the form of the latest instalments of Captain Marvel and West Coast Avengers, both highly entertaining reads from one of Marvel's most effervescent writers. DC have the likes of Naomi #3, Pearl #7 (so glad this is an ongoing now) and Batman #63 (natch) and then circling back to Image again for Criminal #3. All in all this is shaping up to be one of the most high quality weeks of the year so far. Go comics!